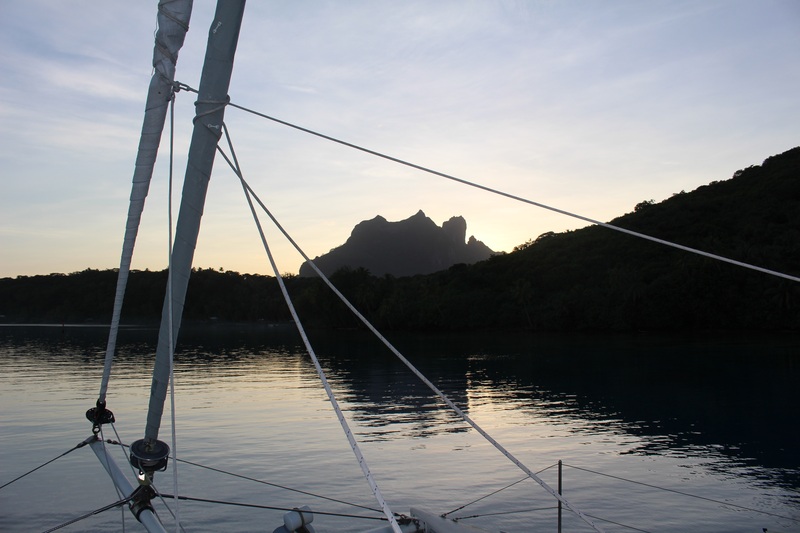 After checking out of French Polynesia in Bora Bora, we anchored out in the lagoon and got an early start in the morning. We motored the ~25 miles to Maupiti. 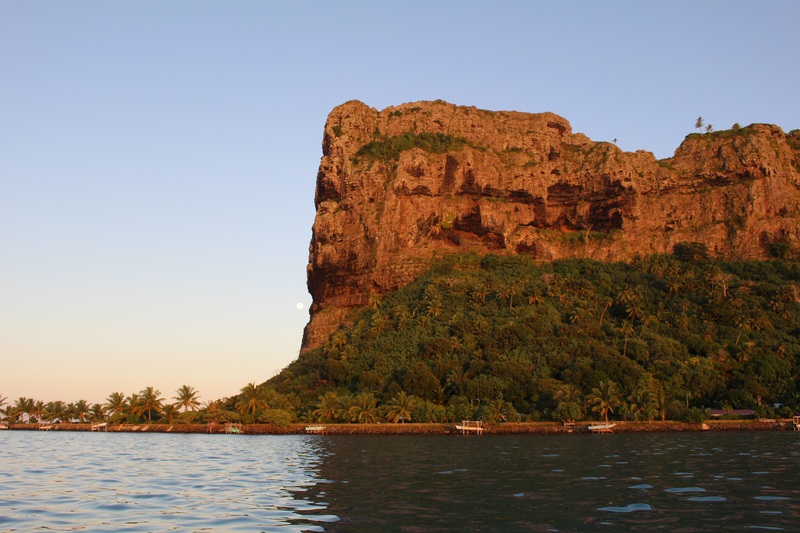 This island is still French Polynesia, but it doesn’t have a gendarmerie. Hence the check out from Bora Bora. Maupiti has a challenging entrance through the reef. 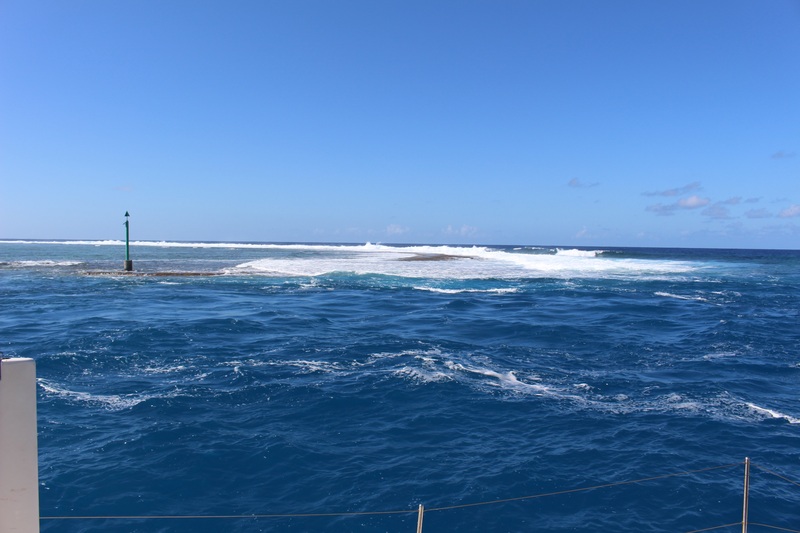 The reef is relatively low on the south side, so waves from the south break over the reef into the lagoon. Most of that water flows back out through the pass. Reportedly there can be a current up to 9 knots flowing out. Nine knots is faster than we can go with both motors running. In addition, the south-flowing current hits the waves coming in from the south, potentially creating dangerously steep/breaking waves. When these conditions occur we are told that even the ferry does not go to Maupiti. And if you are at the island when the conditions develop, we’re told you have to wait it out, perhaps for three days, before you can safely leave. 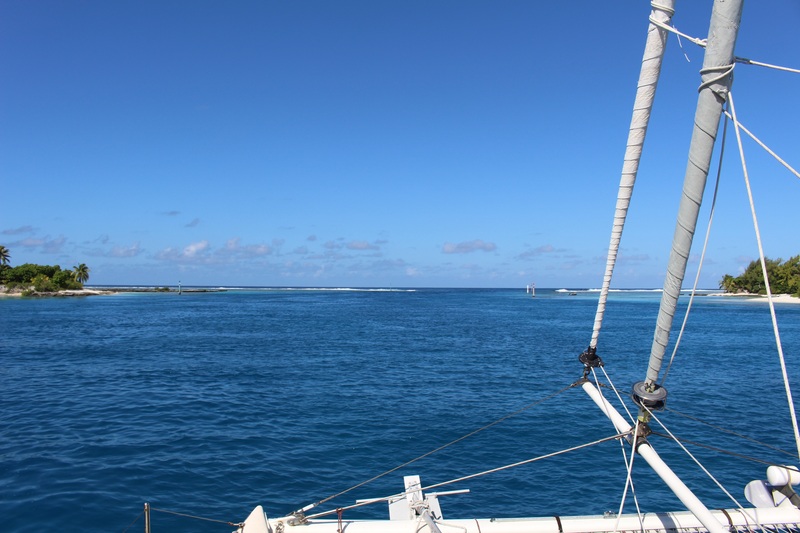 So apparently most yachts leave Bora Bora and sail by Maupiti without stopping. The wind has been light and the waves moderate; we decided to give it a try. The narrow pass and 2.5 knot current at “slack water” at noon, and the impressive surf close by on each side, did make for an adrenaline rush as we wondered if we would be surfing a wave in. But in fact it was not difficult to get through the pass. And what a great place to be! 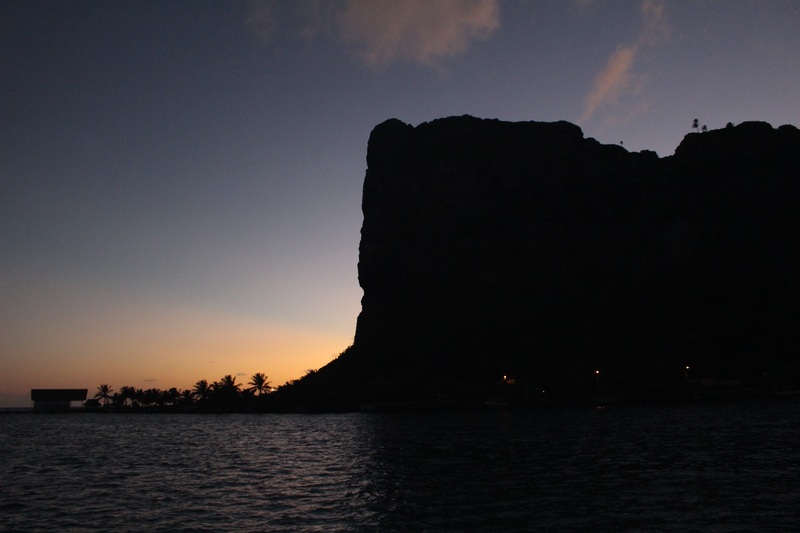 We anchored in a secure spot with a good breeze, and an unbelievable view of the island’s cliffs and peaks. We went ashore and found nothing “touristic” — just wonderfully friendly people. There are a couple tiny stores (where you stand at the window and tell the proprietor what you want; you don’t go in and pick things off the shelves). There was one small shop selling local crafts — mostly shells. There was one restaurant, not open when we walked by. There is a bakery that seemed to indicate it sells croissants in the morning. There was some fruit for sale. And we stumbled upon a woman selling breaded/battered fish out of plastic bins at the side of the road, and we decided that was our dinner. Looming over it all is the central mountain, with awesome vertical cliffs. We were constantly looking up as we walked the street. The town is the narrow flat area between the cliffs and the water. 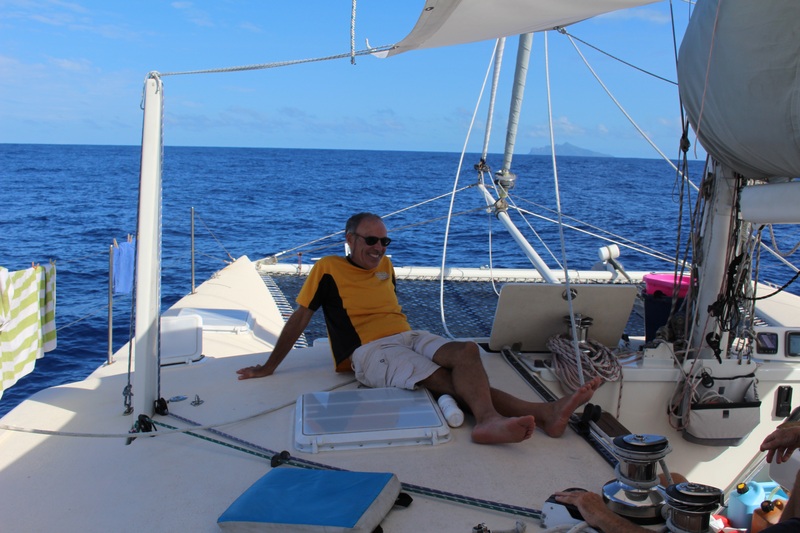 Bob making the adjustment to the challenging life aboard. Maupiti in the distance. Bob climbed to the summit and took this photo. We’re anchored to the left; one other boat came in, further right. 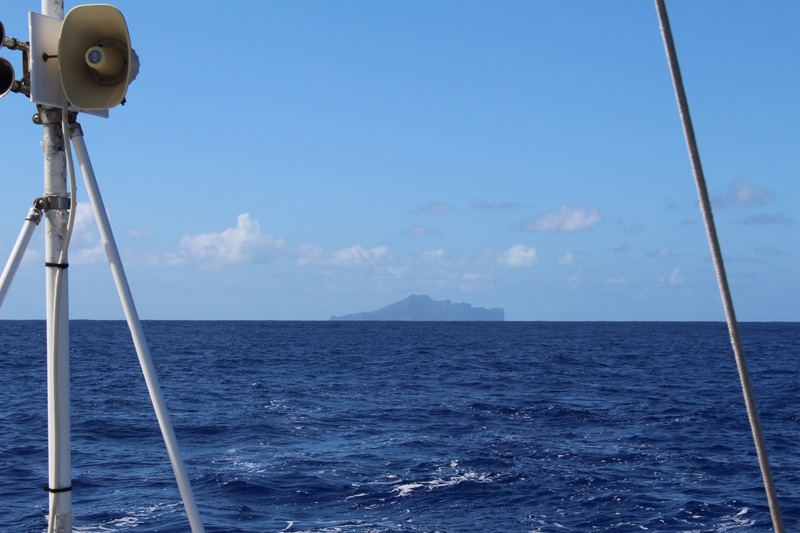 Between the two islands is the channel to the pass through the reef. 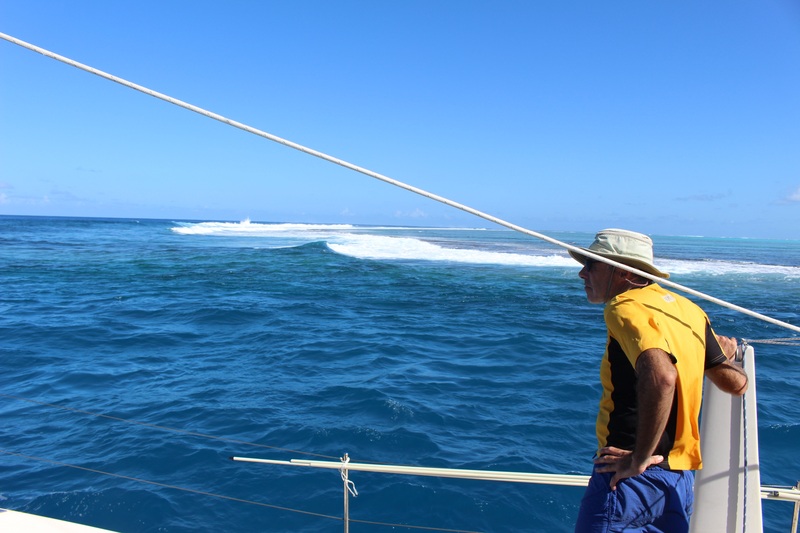 …reef to starboard. Thankfully the surf is tame today. 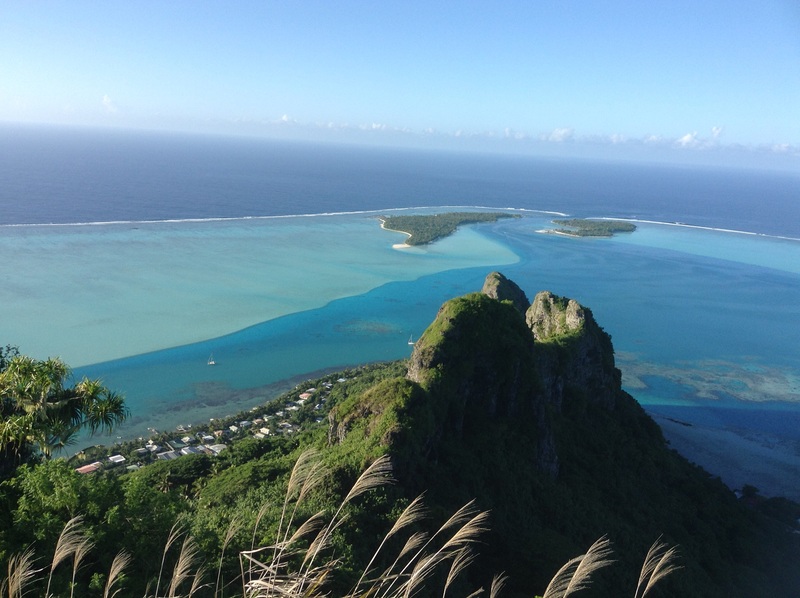 Last look back at Maupiti, and end of two splendid months in French Polynesia. Hard to imaging being the only boat there. The shot from the top of the mountain says it all! One question: what is the loud speaker for? The speaker is a “hailer” that has only been used by Tim as a way to embarrass us all! What a way to end your time in Polynesia! Glad you got in during safe conditions — over the years, plenty have been less lucky. As always, the higher the risk, the greater the reward, so you’ve got great pictures for your site, and learned skills needed to confront dangerous situations later on. Happy sailing.